The Residence Hotel is located on Quay St. which is a pedestrian street. 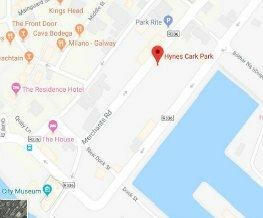 If you are traveling by car, we have discounted car-parking available in the Spanish Arch Multi-Story car park, just a 3-minute walk from the hotel, at the end of Quay St. This car park is located at the end of Quay St.
A rate of €12.00 per 24 hours at the Spanish Arch/ Claddagh Car Park. - View a map of the hotel and car park location. A rate of €8.00 per 24 hours the HYNES YARD Car Park. - View a map of the hotel and car park location. It is easily accessible from Merchants Road or Dock Rd and just a couple of minutes walk to the hotel.